I wish I was writing to tell you that Google was offering a $50 or $100 discount to its Pixel phones, but instead I’m just here to tell you that you can order them again. I know, that’s not exactly ground-breaking news, but Google Store orders of the Pixel XL in particular haven’t exactly been there for weeks outside of a few short pop-ups. Today, both the Pixel and Pixel XL can be ordered again from Google, though there are some wait times on the XL. The regular Pixel is basically in-stock in all variations. That means 32GB or 128GB models in any color you choose (outside of Really Blue which is only a 32GB phone). The Pixel XL can’t be purchased in 128GB configurations at the moment, but at 32GB it can. With that said, you won’t get it for a few weeks. At this time, the 32GB variants of the XL are showing wait times of 2-3 and 4-5 weeks. Should you order a Pixel XL, you likely won’t have it in time for Xmas, but you can at least put an order in. Wait, why not just order from Verizon, you ask? Because Verizon’s units are slightly special in that Verizon does still have some control over them. 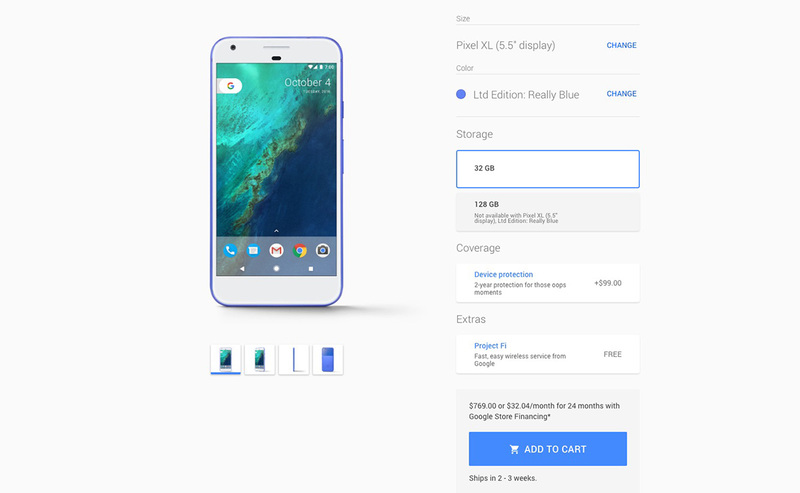 So far, they are sticking to this idea that they will allow Google to update them with the Google Store Pixel phones, but you just never know how long that’ll last. So, if you want the full Google experience on Google’s own phones, you need to buy them from the Google Store.